Paul Mudgett - PR Mudgett, Ltd. Choosing the right platform on which to build games was critical to the quick success of three-year-old Spin Games in Reno. Founder and President Kent Young is very pleased that his team chose to work with HTML5, which gave them the ability to develop one platform with multiple components to create for-wager and social games. Read more here. You wouldn't drive across the country without a map, and you shouldn't try to start or run a business without a business plan. General Eisenhower said, "Plans are nothing, planning is everything;" and most of a business plan's value comes from the thought process you go through while writing it. Read more here. Here are my prognostications for 2015. The diversification of the Northern Nevada business community will gain steam with more startups and relocations of technology related manufacturing, service and development organizations focusing on the region. All of the major announcements of last year including Tesla, drones and entrepreneurial growth have created a momentum that will change the landscape of Northern Nevada. Read more here. Having a strong visual brand on social media helps create a memorable association between your audience and your brand, and increase overall brand awareness. But good visual social branding doesn't have to be complex and complicated. Here are four easy ways to establish and implement your visual brand on social media. Read more here. 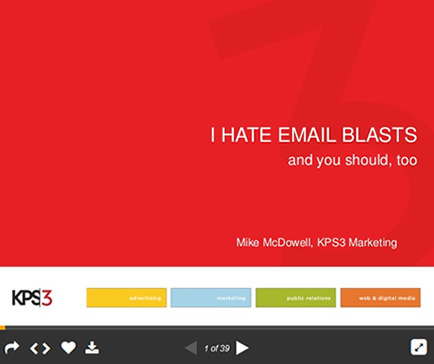 In case you missed Mike McDowell's riveting and humorous presentation on email blasts, he has made it available for everyone to see and use.